Excellent foliage plants in a tropical garden, Calathea varieties are also widely used as indoor plants. Calathea are another of the ‘ornamental gingers’ these are from tropical Central and South America vary in both size and form. The spear shaped leaves grow from the roots so these are an indoor or tropical plant that do not really grow that tall. Grown for the foliage as well as the flowers C. lancifolia is widely used as an indoor plant , long lime green leaves with darker green patterns and an interesting undulating or wavy edge. The underside of the foliage is a deep burgundy red. Will reach around 1m. Filtered light and a warm position indoors, keep moist but not wet. Calathea roseo picta hase large rounded foliage but with the same contrasting light and dark green foliage. 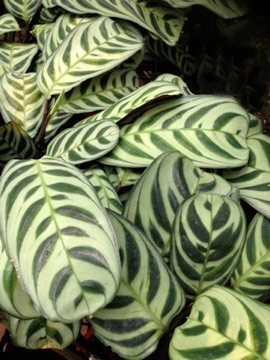 Used as ground cover plants in tropical areas and as house plants elsewhere, mainly for the colorful foliage species such as Calathea zebrina with its two tone green striped foliage and Calathea orbifolia with its large rounded leaves are both popular species. C. zebrina is aptly named dark green foliage with paler green veins. C. burle-marxii can handle cooler conditions than many, slow growing and rare in cultivation for this reason, it does have lovely pale blue to white flowers. C. ornata is another with wonderful deep red underside to the foliage, green with a light green / pink stripe. C. exotica (pictured right) is another worth consideration. These are a tropical plant and require warm conditions or will need to be grown indoors where they are widely used as house plants. 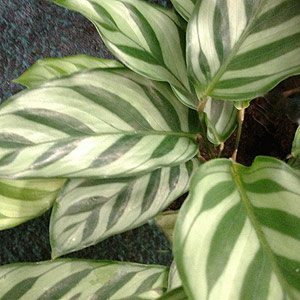 Calathea prefer growing conditions that provide a moist but well drained soil and full sun to part shade. All Calathea will have older leaves that will turn yellow and then drop off. Other leaves can also turn yellow and this problem can be caused by a number of factors. Overwatering – This causes root damage. Under watering – Yellowing can occur quickly if the plant is under watered. A good soaking will help it recover. Over fertilising – This can cause leaf burn.